Sai is the God of Luck. Those familiar with him call him by his nickname, Lucky. He was born a mortal and had the talent to spread luck to others, but not to himself. He became a soldier, but he was killed in his first battle just as it was won. Ebonarm appeared to him, and offered him immortality if he agreed to spread his luck around. He said the gods were overworked seeing to events, and thought that Sai's inborn talent would balance things out. He readily agreed, and he was told that he could keep his body for a time before it began to fade. He became a wanderer and tinker by trade, roaming the world with his grey wolf Grellan. It was then that he met an unlucky woman named Josea in Skyrim, whom he married and had a child with - "a beautiful baby girl with silver hair, but eyes of cornflower blue". 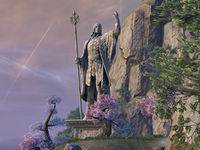 He brought prosperity to the region, which resulted in the Snow Elves being driven from Skyrim and the Nords taking over large parts of Morrowind and High Rock. His visits to Josea became less and less frequent, until one night she eavesdropped on him arguing with several people. These were avatars of Mara, Ebonarm and other minor gods. He was told that he could no longer stay with his family, as the luck he had given to the area was having dire consequences. He was tasked to set things right again, and his body was to be taken from him. He could only visit his wife once a year, and only in spirit. He begged Mara for a body, and she allowed him to take the form of a wolf occasionally. When the gods had left, Josea confronted him. He told her of his true origins and explained the situation. He kissed their children goodbye and told her that she would feel his presence once a year. It took Sai one hundred and fifty years to set things right, and he needed a lot of help. Nords still hold him in high regard which is why they prefer not to kill wolves unless necessary. In King Edward, a character known as the Slave of Moraelyn was a descendant of Sai. He revealed to Edward that he feels Sai's presence once a year, and his grandmother used to leave a bit of food and a bowl of milk out on winter nights 'for the Wolf'. Excessive worship of Sai causes the disease known as Sai's Affliction. Sufferers of the disease have been abandoned by Sai, and long for the god's presence. They are driven to incessant gambling, seeking proof of the god's favor. This usually leaves the victim in poverty or debt. Reliquaries dedicated to Sai can be found throughout the Iliac Bay region. Sanguine is a Daedric Prince whose sphere is hedonistic revelry, debauchery, and passionate indulgences of darker natures. Satakal, the Worldskin, is the Yokudan god of everything, and a fusion of the concepts of Anu and Padomay (Satak and Akel), or the habitable universe resulting of their interaction, also called the Aurbis or 'The Gray Maybe'. Driven by hunger to eat one world to begin another, Satakal has much in common with the Nordic Alduin. In Yokudan mythology, Satakal has done (and still does) this many times over, a cycle which prompted the birth of spirits that could survive the transition, notably Ruptga, the first who learned how to do so. These spirits ultimately became the Yokudan pantheon. Satakal is a popular god of the Alik'r nomads. Redguard creation myth holds that they are doomed to mortality because they are very far away from the real world of Satakal, and the safe haven of the Far Shores is too far away for them to jump from the mortal world. Yokudan version of Lorkhan. Tall Papa wanted help regulating the spirit trade, so he created Sep, also called the "Second Serpent", from the detritus of past skins. Sep could not think straight due to intense hunger, and Tall Papa sometimes had to reach down his throat and save spirits Sep had erroneously eaten. Sep eventually got tired of helping Tall Papa. Eventually driven crazy by the hunger of Satakal, Sep convinced some of the gods to help him make an easier alternative to the Walkabout, the process of sliding between worldskins to escape the hunger of Satakal which was pioneered by Tall Papa. Tall Papa, of course, knew better, and just shook his head as they formed a ball from past skins to live on. Sep's skin-ball became the mortal world, and the spirits who followed Sep became trapped there to live out their lives as mortals, and they had to resort to procreation to have any form of survival. Sep was punished by Tall Papa for his transgressions, but his hunger lives on as a void in the stars, a 'non-space' that tries to upset mortal entry into the Far Shores. Tall Papa is said to have squashed the Second Serpent with a big stick. While the rest of the new world was allowed to strive back to godhood, Sep could only slink around in a dead skin, or swim about in the sky, a hungry void that jealously tried to eat the stars. Seth is a dark god worshipped all across Tamriel. The Brotherhood of Seth runs temples in many major cities. Before its destruction, Gideon, a city in Black Marsh, was supposedly owned by the followers of Seth. During the Imperial Simulacrum, one of the members of the Brotherhood of Seth in Camlorn, High Rock learned of Jagar Tharn's plot, and stole the brotherhood's map of the entrance to the Crypt of Hearts in a maddened attempt to restore the true Emperor by recovering a piece of the Staff of Chaos hidden there. With the aid of the brotherhood, the Eternal Champion recovered the map from the Mines of Khuras and was directed to the Crypt of Hearts. An obscure god, whose High Priestess once threatened all of Valenwood with an army of spiders. In Bretony, the Bad Man is the source of all strife. He seems to have started as the god of crop failure, but most modern theologians agree that he is a demonized version of the Nordic Shor, born during the dark years after the fall of Saarthal. Shor is the Nordic version of Lorkhan. He sided with men after the creation of the world. Foreign gods (i.e., elven ones) conspired against him to bring about his defeat, dooming him to the "underworld". Atmoran myths depict him as a bloodthirsty warrior king who repeatedly led the Nords to victory over their Aldmeri oppressors. Before his doom, Shor, sometimes also called the Children's God, was chief of the gods. It is believed Shor can be found at Sovngarde, an Aetherial utopia he built which is open in the afterlife to all Nords who prove their mettle or die valiantly in battle. Though dead, ancient Nordic legends speak of Shor's ghost being "sung" back into the world at momentous occasions in Nordic history. Sithis (or Padomay) is a representation of the one primordial state of chaos. It is also the patron of the Dark Brotherhood, in which it is given a male persona and said to be the Husband of the Night Mother. Sithis is described as an equal but opposing force to Anuiel. Though the Dark Brotherhood often anthropomorphizes Sithis as a "Father", they acknowledge he is neither a Daedra nor an Aedra, and does not dwell in any plane of Oblivion. Sithis has a place in almost all of the creation myths of Tamriel, under many different names. In the Redguard tradition it is referred to as Akel, an endless hunger that drives Satak (Anuiel), The First Serpent, to devour itself endlessly. When the First Serpent finally eats its own heart, it dies, but is reborn as Satakal (Aurbis, The Gray Maybe); a new Snake, in which things (Aedra and Daedra) could come to know themselves. Though the renditions differ as to whether Sithis or Anuiel came into being first, most suggest that though Anuiel was largely responsible for bringing the Aedra into lasting existence, Sithis is responsible for Lorkhan coming into being, and thus all of mortal creation. Some lore also suggests the Daedra are "of Sithis' blood", which is supported by their roles as bringers of change. 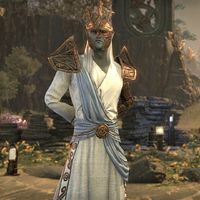 Sotha Sil, or Seht, wizard-mystic god of the Dunmer and "si" in the Almsivi, was the most enigmatic member of the divine Tribunal. Known as the Father of Mysteries, Magus, Magician, Sorcerer, Tinkerer, Clockwork God, the Light of Knowledge, the Inspiration of Craft and Sorcery, and the architect of time and a binder of Oblivion. For more information, see Sotha Sil. Stendarr, also known as "Stendarr the Steadfast", is the God of Mercy, Charity, Well-Earned Luck, and Justice. He is also acclaimed as the God of Compassion, and Righteous Rule by Might and Merciful Forbearance. Stendarr is the Apologist of Men, patron of the Imperial Legion, magistrates, rulers, and knights errant, and one of the Divines. Nordic precursor to Stendarr, brother of Tsun. Shield-thane of Shor, Stuhn was a warrior god that fought against the Aldmeri pantheon. He showed Men how to take, and the benefits of taking, prisoners of war. An Aldmeri god-ancestor of magic, Syrabane aided Bendu Olo in the Fall of the Sload. Through judicious use of his magical ring, Syrabane saved many from the scourge of the Thrassian Plague. It is said that the ring remains under the command of "Archmage" Syrabane. He is also called the Apprentices' God, for he was a favorite of the younger members of the Mages Guild. A grand statue of him is said to stand on a coastal cliff of Artaeum, which he allegedly posed for in-person. He eventually became revered as a god as Altmeri society developed. A Snow Elf temple was dedicated to his worship. ^ Gelebor's dialogue in Dawnguard. This page was last modified on 9 February 2019, at 07:10.